Bihar-pa was born east of Bodhgaya in the city of Kuta. At birth, as Indian custom goes an astrological chart was done and it stated he would be powerful and help develop Buddhist teachings. At Nalanda, he received his monk vows from Vinaya writer Lapon Toywa-la. Bihar-pa was very wise and he studied medicine, abhidharma, astrology, vinaya, madhyamaka, six paramitas of Maitreya, geography, etc. 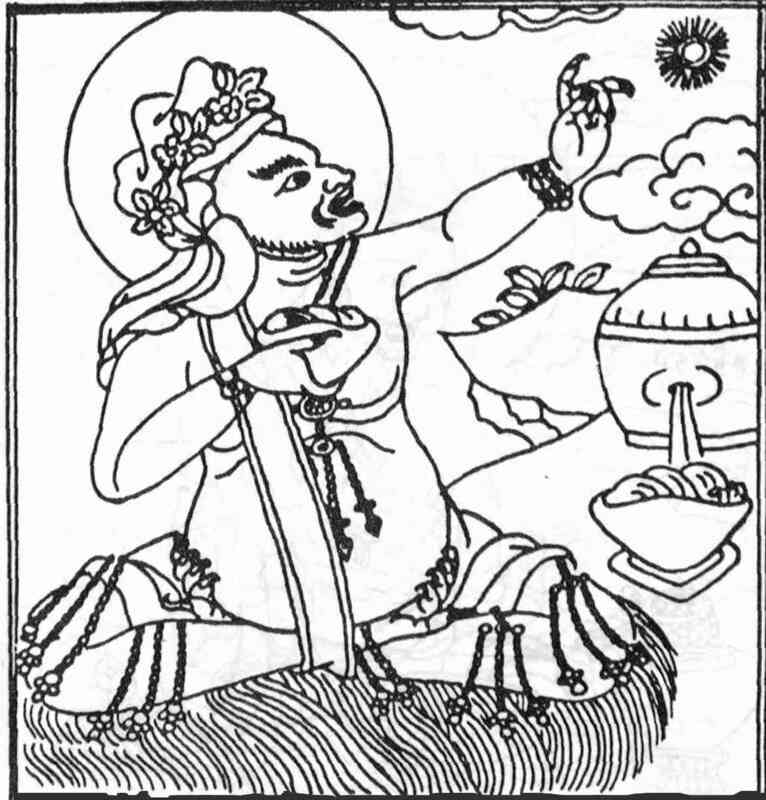 The abbot of Nalanda, Choje Shama gave him the teachings and empowerment of Kalachakra. Now during the day Bihar-pa studied, taught, debated and, in the evening meditated on Heruka. He realized compassion, but he felt his yidam practice had no result. He thought to himself "My karma and merit must be low so I'll just do Bodhicitta practice". While sleeping that night, a Dakini spoke to him, "Get up, do your practice. I'll be with you". On awakening, his room was full of dakinis. Since he was a realized tantrika, he did not follow in line with the rules of the monastery. He had wine in his room, did many tsog offerings, and his room was full of dakinis. Some monks saw these things in his room as being just women and wine and complained. Bihar-pa explained, "I have no problem with my practice". The monastic guardian said, "I know that, but monks of weak will might have problems with this". Since it is said he committed some infraction, he was expelled and was not allowed to leave by the gates. So he flew up and over the wall. He left behind his robes and wore the clothes of a siddha, singing vajra songs. At Varanasi, he came to the Ganges river. Not wanting to swim across and make the river dirty, he caused the river to part and crossed to the other side. Later the monks realized that he was a sage and apologized. Bihar-pa traveled to many places. In Varnasi, King Tem Bala Ker invited him to his palace. The king, seeing that he was a Buddhist, chained him up and threw him into the river Ganga. Bihar-pa returned and the king was unable to control him. So the king and his subjects (of course) accepted Buddhism. Bihar-pa went to South India and came to a river. There was a boatman there and he wanted money to carry Bihar-pa across, Bihar-pa said, "I have no money", and stopped the river and crossed. By demonstrating this ability to the boatman and due to the boatman's positive potential, great faith arose in him. He became a student of Bihar-pa and later came to be a great tantric practitioner called Sage Drom-Bi-Heruka in the linage of Atisha. Another time he went to a bar, where there were many women. There he drank as many drinks as they served him, drinking the bar dry. The owner wanted to be paid and Bihar-pa said he would pay him at sunrise. But the sun didn't rise. The king was afraid and asked for light. Bihar-pa let the light come and because of this incident the king gave rise to strong faith for Bihar-pa. The king called him a sage. Now this king was the patron of 500 Repa-chen (long-haired Hindu sages) and he wanted him to be his Lama. So Bihar-pa went to this shrine where the custom was to offer ten thousand sacrifices a day. He saw a goat and a buffalo being offered to Siva. He mase a prostration in front of the statue and it crumbled into a pile. The pile had the shape of the face of Chenrezig. The king was afraid, and wanted the pile removed, but the pieces formed into an image of Chenrezig and Bihar-pa said "this is your practice." These sages were very strong in their faith except for one who followed Bihar-pa. He became a strong tantric practitioner in southern India, named Nakpo-pa, the Great Black One. In the south of India at a place called Tambar Puktin, king Chilla made a copper statue of Siva that measured 300 feet in height. Bihar-pa's student Nakpo-pa went into the shrine and kicked it whereby it fell. Hindus promised not to offer live sacrifices any more and many Hindus accepted Buddhism. At Sahaza Denday there was a dakini statue made out of stone. Human sacrifices were made as Tsog offerings. Bihar-pa went there and he touched the rocky landscape around the shrine and it broke. He went inside the shrine, grabbed the image by her ears, and pushed the head into the body. The people where sad and unable to fight him. he said :"if you promise not to sacrifice any more animals, i'll return her to her original state". He repaired the statue after they promised and the dakini came to be known as "Lhamo Hold by the Ears". Bihar-pa also went to Nepal. At one place people where again sacrificing animals. He went into the temple and pushed the deity out with his big toe and said :"Stop sacrificing and I'll return her. Use rice instead". He pushed the statue back. The Dakini Lhamo Sin Data of Nepal, spoke and said :"The people of Nepal would be safe and bountiful if they sacrifice 1,000,000 animals in three years. The kingdom of Nepal was unable to do this because there weren't enough animals. Bihar-pa told them to use sesame seeds. When the seeds were put into the mouth of the dakini, one could see animals inside the flames that were on her palms. Bihar-pa went to Daywa Kuta where there was a special Chenrezig. He told Chenrezig the things that he did for the Dharma to help sentient beings. Chenrezig said :"Your power can make Mount Meru shake but you cannot change the karma of beings: it is very deep, you can't stop it. Don't disturb them, practice compassion". Bihar-pa thought that he could stop the animal sacrifices in those places where this had been the custom in the worship of Siva. He thought that he could do this which was more peaceful than just destroying their temples. He thought, be peaceful, not wrathful; teach them; explain cause and effect to them. They'll learn and understand. They'll come to follow Buddhism. Chenrezig told him, "your student Nakpo-pa went to the south of India and many Hindus became Buddhist. Don't do the actions of a Hindu sage wear regular clothes, not like Tilopa and Naropa". Instead of dying Bihar-pa dissolved into a statue of Chenrezig that was made of stone. He was the most powerful of all sages in India.